The high cliffs of Eastern Siberia – which mainly consist of permafrost – continue to erode at an ever quickening pace. This is the conclusion which scientists of the Alfred Wegener Institute, Helmholtz Centre for Polar and Marine Research have reached after their evaluation of data and aerial photographs of the coastal regions for the last 40 years. 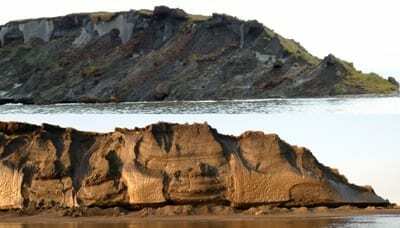 According to the researchers, the reasons for this increasing erosion are rising summer temperatures in the Russian permafrost regions as well the retreat of the Arctic sea ice. This coastal protection recedes more and more on an annual basis. As a result, waves undermine the shores. At the same time, the land surface begins to sink. The small island of Muostakh east of the Lena Delta is especially affected by these changes. Experts fear that it might even disappear altogether should the loss of land continue. The interconnectedness is clear and unambiguous: The warmer the east Siberian permafrost regions become, the quicker the coast erodes. “If the average temperature rises by 1 degree Celsius in the summer, erosion accelerates by 1.2 metres annually,“ says AWI geographer Frank Günther, who investigates the causes of the coastal breakdown in Eastern Siberia together with German and Russian colleagues, and who has published his findings in two scientific articles. This increase in temperature is not without consequences. Whereas a thick layer of sea ice used to protect the frozen soil almost all year round, it now recedes in this part of the Arctic for increasing periods of time during the summer months. The number of summer days on which the sea ice in the southern Laptew Sea vanishes completely grows steadily. “During the past two decades, there were, on average, fewer than 80 ice-free days in this region per year. During the past three years, however, we counted 96 ice-free days on average. Thus, the waves can nibble at the permafrost coasts for approximately two more weeks each year,“ explains AWI permafrost researcher Paul Overduin. The waves dig deep recesses into the base of the high coasts. The result: The undermined slopes break off bit by bit. During the past 40 years, the coastal areas surveyed retreated on average 2.2 meters per year. “During the past four years, this value has increased at least 1.6 times, in certain instances up to 2.4 times to reach 5.3 meters per year,“ says Paul Overduin. For the little island of Muostakh east of the harbour town of Tiksi, this may well mean extinction. “In fewer than one hundred years, the island will break up into several sections, and then it will disappear quickly,“ predicts Frank Günther. On its northern tip, the island shows fluctuating annual erosion rates between 10 and 20 meters per year, and it has already lost 24 per cent of its area in the past 60 years. Because the subsurface here consists of more than 80 per cent of ice that has formed within the soil, and since the ice is gradually melting, the island’s surface collapses as well. The scientists speak of a 34 per cent loss in volume. “If one bears in mind that it took tens of thousands of years for the island to form through sedimentary deposition, then its disintegration is proceeding at a very rapid pace,“ says Paul Overduin. In addition, long-term studies conducted by AWI scientists show the impact of coastal erosion for the sea as well. Depending on the kind of erosion and the particular structure of the coast, between 88 and 800 tons of plant-, animal, and microorganism-based carbon are currently washed into the sea per year and kilometer of coastline – these are materials that had been sealed in the permafrost thus far. With regard to the Laptev Sea, this translates into approximately one eighth of the organic carbon that is transported by the Lena River annually – and the Lena is a river that encompasses a drainage basin the size of the Mediterranean. “We can, however, assume larger quantities if this accelerating coastal erosion we currently observe continues,“ the scientists write in their subject-specific paper for the Biogeosciences special volume: “Interactions between the land and sea in the Lena Delta Region.“ Once in the water, carbon may turn into carbon dioxide and, as a result, contribute to the acidification of the oceans: the composition of our oceans becomes less alkaline. April 15, 2019 - Thawing Permafrost Could Release Anthrax-Causing Bacteria In Siberia IFLScienceThawing ice in the Earth's polar zones is releasing all kinds of nasties. Think prehistoric viruses, nuclear fallout, greenhouse gas, and anthrax-causing spores. April 6, 2019 - Thawing permafrost is triggering landslides across the Arctic CosmosSpring in the town of Deadhorse was 20 degrees warmer than average, and that means bad news, writes Dave Petley from the UK's University of Sheffield. April 3, 2019 - Thawing Permafrost In The Colorado Rockies Is Releasing Carbon Dioxide Wyoming Public MediaA recently-published study shows alpine tundra soil high up on Colorado's Rocky Mountains is releasing more carbon dioxide into the air than it is. March 21, 2019 - Study: Thawing alpine permafrost a stealth source of CO2 UPI NewsScientists report evidence that Colorado's Front Range tundra emits more CO2 than it absorbs each year.